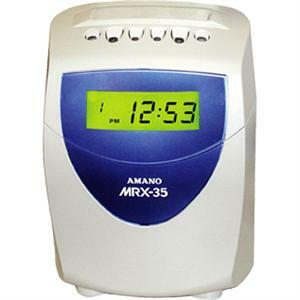 The Amano MRX35 electronic calculating time clock is a mid-range calculating time recorder ideal for companies with 50 employees or less. The MRX35 is a reliable and economical totalizer that can make time record keeping a breeze. Able to handle a weekly or bi-weekly pay period, and standard punching requirements (two In/Out punch pairs per day). the MRX35 will save you time and help avoid calculation errors for payroll processing. Accommodates weekly and bi-weekly pay periods. Up to four punches per day (two In/Out pairs). Programmable and selectable 2-color printing allows for identifying early and late punches. Dimensions: 9.17" x 6.69" x 4.53"